Although transmission installation and adjustment appears straight-forward, you should take an orderly, methodical approach to ensure success. You’re either swapping in an AOD, AODE, or 4R70W, or you’re removing and reinstalling one. Size up the job before you get started and make a checklist of what’s needed. Few things are more frustrating than taking your car apart only to discover you’re missing crucial parts.Work out a game plan while you still have transportation. And remember, you cannot afford mistakes during installation and break-in. Errors can mean expensive damage because you missed important adjustment techniques. 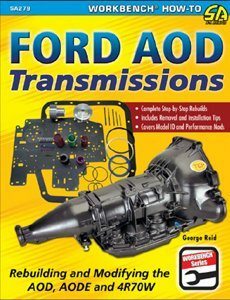 The most common transmission swap with older Fords is from a C4, C6, or FMX to an AOD or manual 5-speed. The focus here is putting a Ford AOD into a classic Mustang and other vintage Ford applications, which are the more common swaps. 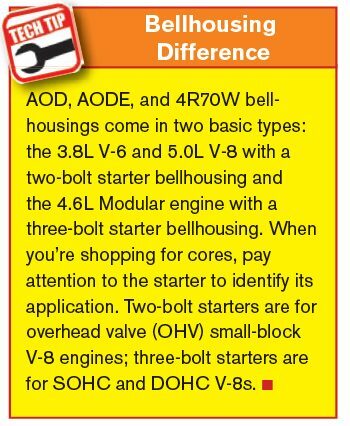 If you’re going from a C4 to an AOD with a small-block V-8 application, it is important to understand the differences between them. If you’re going from a C6 to an AOD in a big-block application, the differences are even more significant because you’re going to need an adaptor kit. This is B&M’s Street/Strip AOD transmission (PN 114501) with 2.40:1 first gear, 1.47:1 second gear, and .67:1 overdrive. B&M builds and ships a remanufactured AOD transmission with new clutches and bands, seals, and any hard parts as needed, including bushings, bearings, and roller clutches. These transmissions are factory calibrated and ready for operation. All you need to do is service them with fluid and a new B&M torque converter. Don’t forget proper TV cable adjustment. 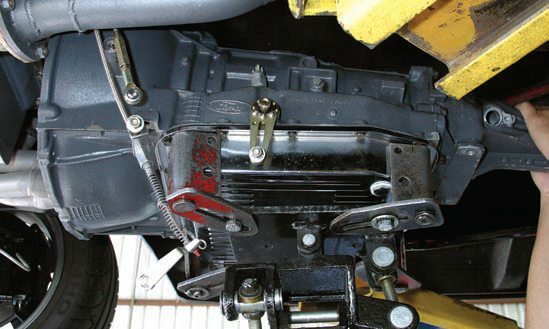 Be prepared to change the manual shift linkage around to fit your application if needed. 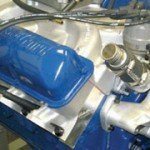 Adaptor kits are available for both the FE- and 385-series Ford big-blocks. Keep in mind these adapter kits alter the transmission mount location by 1 to 2 inches toward the rear of the vehicle. An AOD behind an FE or 385 makes the transmission package 1 to 2 inches longer because you’re adding 1 to 2 inches to the bellhousing through the thickness of the adapters. Because the AOD is longer than the C4, you need a special crossmember and related parts available from suppliers such as California Pony Cars, PATC, Mustangs Plus, California Mustang, and a host of others if you have a vintage Mustang or Cougar. 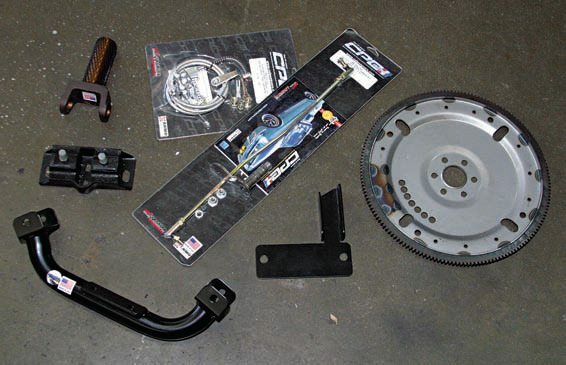 The kit consists of the crossmember, transmission mount, TV cable, shift linkages, 164-tooth flexplate, slip yoke, and hardware. This kit makes it easy to perform an AOD swap. However, not everyone does a Mustang/Cougar AOD swap. 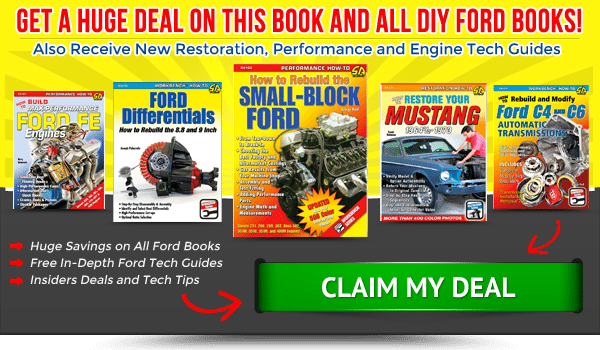 There are plenty of swaps performed in other Ford vehicles such as the Maverick, Comet, Fairlane, Torino, F-Series trucks, Bronco, and a host of other vintage Fords. Conversion kits are available for many of them, but not all. Old transmission removal means being prepared with fluid drainage from both the sump and the torque converter. 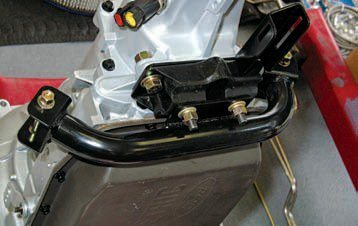 Disconnect the driveshaft, shift, and kickdown linkages. Have a solid means of support beneath the transmission. Remove the dust cover to get at the torque converter and flexplate. 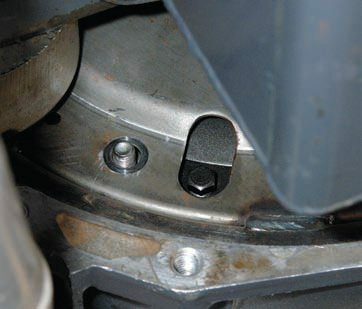 Remove the torque converter fasteners with a 5/8-inch socket. Rotate the engine crankshaft to get at hard-to-reach fasteners. 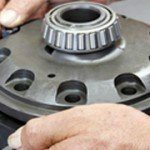 Protect the torque converter during transmission removal. The converter can fall out and cause severe damage to both the converter and your feet. You can use a piece of band iron or even a box-end wrench with a bolt through the bellhousing to keep the converter in place. 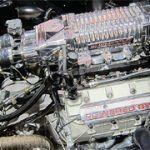 California Pony Cars takes the guesswork out of an AOD swap. They have everything you need including cross-member, mount, 164-tooth flex-plate, TV cable, manual linkage, and slip yoke. This is the California Pony Cars cross-member bolted to an AOD. It clears virtually everything including aftermarket headers. This is one of the better AOD crossmembers on the market. 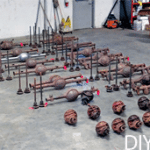 If you’re building a Ford, Mercury, or Lincoln and conversion kits are not available, you must have a crossmember and driveshaft made, which can get expensive. If you are so inclined, you can fabricate your own crossmember, but driveshaft fabrication must be performed by a qualified professional. 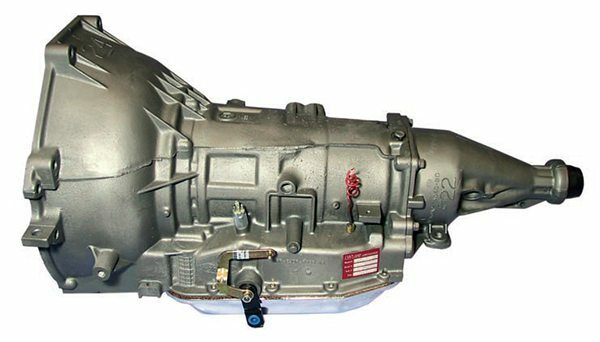 When you are swapping an AOD, it is important to recognize the differences between a C4 or early manual transmission and the AOD. 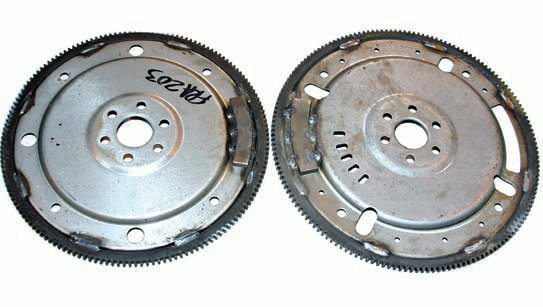 The AOD takes a 164-tooth AOD-specific flexplate instead of the smaller 157-tooth pieces common to the C4 and early Ford manual transmissions. 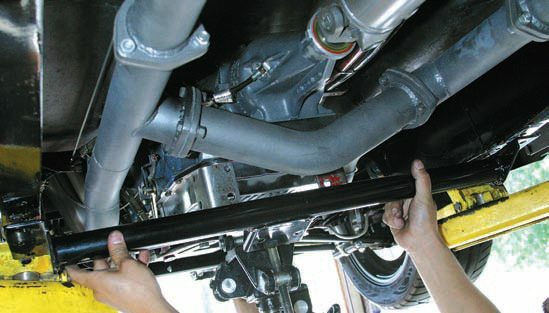 Because the AOD is longer, the crossmember must position the mount farther to the rear of the vehicle to support the transmission. 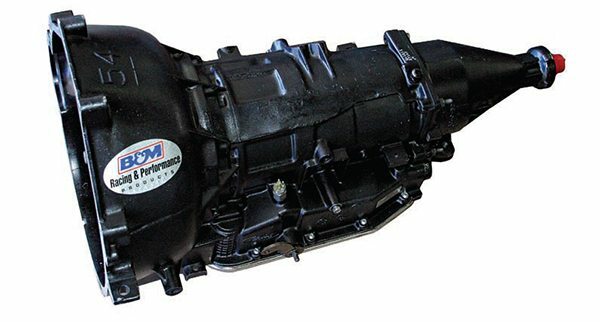 There are no transmission-to-floorpan clearance issues with the AOD or AODE/4R70W in most applications except the Pinto, Bobcat, Mustang II, and Capri (prior to 1979). 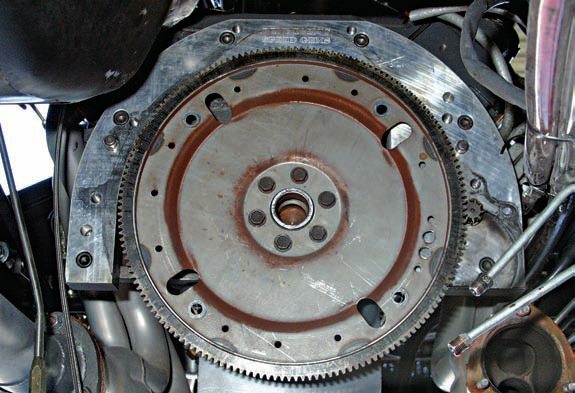 This is the 157-tooth flexplate for the C4 transmission with a 28-ounce offset balance. You replace it with the 164-tooth flexplate for the AOD/AODE/4R70W, which is also a 28-ounce offset balanced. 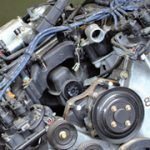 Note the type of engine you have also determines the flexplate type. 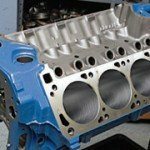 Small-block Ford V-8s, which are externally balanced, are either 28- or 50-ounce offset balanced. Late-model 5.0L engines from 1982-up are 50-ounce. Earlier 289- and 302-ci small-blocks prior to 1982 are 28-ounce. Here are two small-block Ford flexplates. On the left is the 157-tooth version for the C4 Cruise-O-Matic with a 28-ounce offset balance. On the right is the larger 164-tooth flexplate for AOD, AODE, and 4R70W with a 50-ounce offset balance. Small-block Fords prior to 1982 are normally 28-ounce offset balanced. Engines from 1982-up are 50-ounce offset balanced with a larger weight welded to the flexplate. This 164-tooth flexplate is 50-ounce offset balanced with a larger weight. 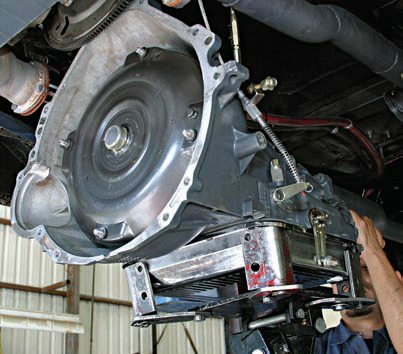 If you’re working with an unknown engine, you have to examine the flexplate to determine the offset balance. Before installation, check torque converter dimensions. Also check the center hub diameter on a B&M torque converter. Although it doesn’t happen very often, not all torque converters fit a Ford crank flange. You must also check the crankshaft flange dimensions. Checking the converter hub and crank flange dimensions lets you know beforehand if the torque converter will fit during installation. Use the reference mark you made during driveshaft removal to get the flexplate lined up perfectly for installation. There is only one way to install a flexplate because the bolt-hole pattern works only one way to prevent improper installation. 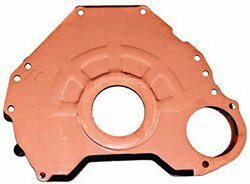 This universal block separator plate from Mike’s Transmission goes between the engine block and bellhousing. It works with both 157- and 164-tooth flexplates as you can see by the perforated starter mount location (lower left). The AOD and C4 transmissions use different block plates primarily because they are different transmissions with two different-size flexplates. This means you need an AOD-specific block plate and dust cover for the 164-tooth flexplate. Because the AOD is longer, you need the appropriate-length driveshaft, which is available from a number of aftermarket suppliers. 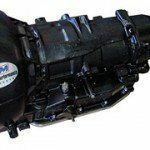 Mustangs Plus, for example, carries a complete line of ready-to-install Inland Empire Driveline driveshafts for these seemingly complicated swaps, which makes them uncomplicated. This is the AOD’s multiplex plug for backup lights and neutral safety. If you cannot find a reproduction, it must come from a donor vehicle. The backup light/neutral safety switch screws into the AOD case. As you move the manual shifter, you move a cam that moves this switch back and forth. In reverse, it grounds the backup light circuit. In any gear, there is an open ground in the start circuit, which prohibits starting. In park or neutral, the ground is complete and the engine starts. Use proper installation equipment such as a transmission jack or a floor jack with a transmission cradle. Make sure the torque converter is properly seated. It is easy for the converter to slip off input shafts and pump drives and wind up with a faulty installation and pump failure. 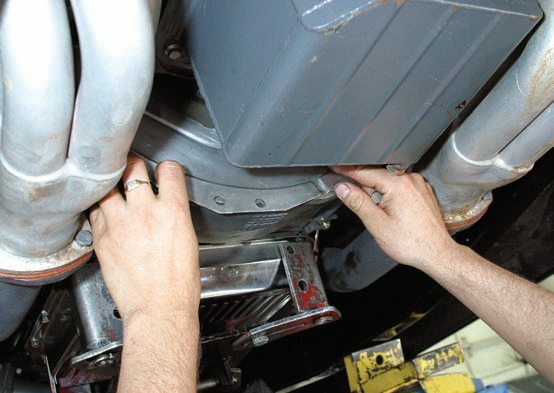 If you can fit your hand between the converter and the bellhousing, it is not properly seated. Tom’s Transmissions in Southern California demonstrates proper installation with the Lokar TV cable and manual linkage free and accessible. This is an AOD installation in an F-Series truck with 390 FE big-block power and a column shift. 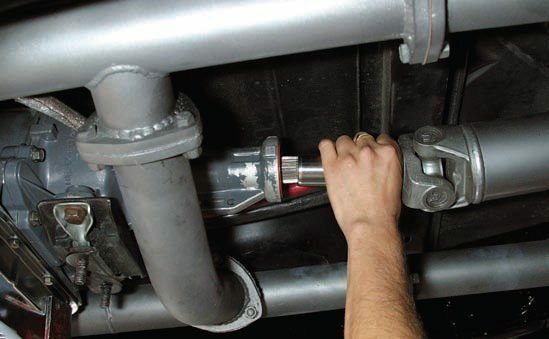 Try not to use rubber hose for your transmission cooler lines. If you must use hose, opt for braided stainless-steel hoses with commercial-grade clamps and keep hose length as short as possible. Make sure the hoses are not touching anything to prevent chaffing. The AOD, AODE, and 4R70W transmissions are designed to accept a traditional mechanical cable-drive speedometer and an electronic version, depending upon your application. 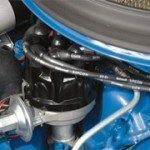 Run transmission cooler lines parallel with the engine/transmission package all the way to the radiator or transmission cooler. This eliminates any chance of leakage and is much safer. 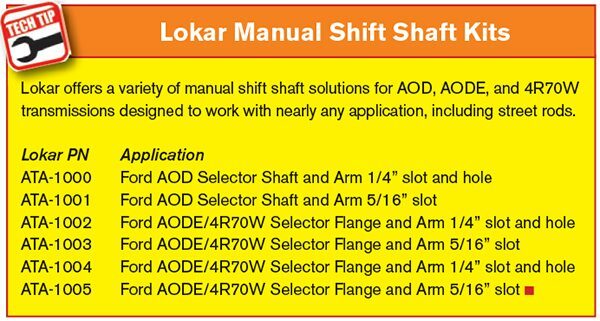 Another important consideration with an AOD swap is the manual shift linkage and column shift versus floor shift. Aside from the obvious differences at the transmission with the manual shift lever pointing upward (column shift) or downward (console shift), you need to have a workable shifter on the driver’s end. Floor-shift applications are easy to adapt using a 1967-up shifter, which has the proper detents. For column-shift applications, you will also need a 1967-up shifter, which can become complicated, depending upon model year and application. You should use 1967-up because of the shift detent positions. Ford Cruise-O-Matic applications prior to 1967 are not traditional P-R-N-D-2-1; instead, they have the Dual-Range Dot and Green Dot, where shift detents don’t match the AOD shift pattern. 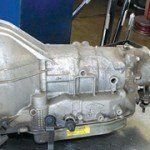 Begin transmission installation by adding 1 to 2 quarts of Dexron III or Mercon V transmission fluid to the torque converter to give both the converter and front pump a good fluid prime during initial firing. This fluid prime ensures plenty of lubrication on start-up plus immediate line pressure. Total fluid capacity is approximately 14 quarts. A huge percentage of this capacity is the torque converter once the engine fires and the converter fills. 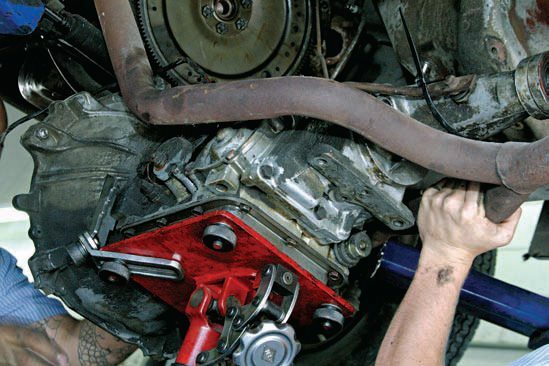 When you fill the transmission sump, be conservative about how much fluid is added. 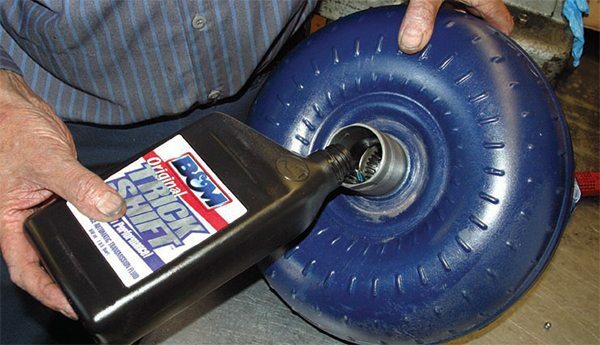 Because transmission fluid expands as it warms, you do not want to fill to the “Full” mark cold. Overfilling the sump causes fluid foaming and malfunction. Foaming creates air in the fluid, undermining hydraulics and lubrication. 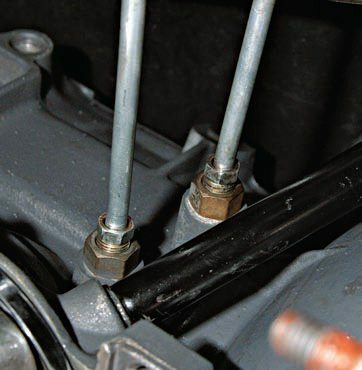 Add transmission fluid to the minimum mark on the dipstick while cold and start the engine. When you fire up the engine, listen for any abnormal noise and be prepared to immediately shut it down if you hear something. 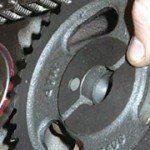 Any squeal or metal-to-metal sound is an indication of improper torque converter installation or front pump/input shaft issues. If the torque converter has been improperly installed, it isn’t engaging the pump and shafts properly. 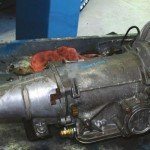 If this is the case, you have to remove the transmission and inspect for damage. Torque converters must be serviced with a minimum of 1 to 2 quarts of Dexron III or Mercon V fluid for a good pump prime and a well-lubricated start-up. When the converter is installed, it fills the pump cavity with fluid. 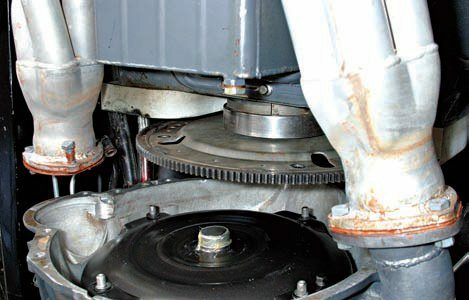 It cannot be emphasized enough how important the flexplate-to-torque-converter alignment is. 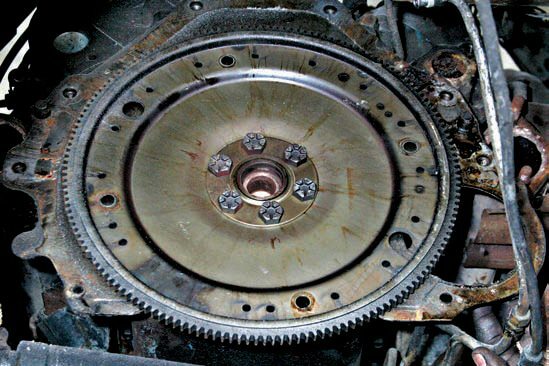 If your torque converter has a drain plug, make sure it is indexed properly at the flexplate. Otherwise, it presses into the flex-plate, causing distortion and damage. LenTech’s reputation comes from making Ford’s AOD, AODE, and 4R70W transmissions competitive in the marketplace and with enthusiasts. This is the LenTech Street Terminator AOD, which is rated to 800 hp with the one-piece billet input shaft, 1-2-3/4 shift pattern, improved line pressure for durability, heavy-duty clutches and bands, additional clutches, improved pump, and revised shift programming. is the mechanical cable-drive type. Speedometer gear selection depends on wheel and tire diameter (overall height). The more teeth the driven gear has, the lower the speedometer reads. 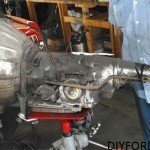 You can shorten your existing driveshaft for an AOD swap or have a shaft made. The California Pony Cars AOD conversion kit comes with a slip yoke, but not the shaft. You have a choice of steel or aluminum. 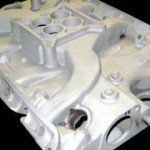 Aluminum weighs less but isn’t always the best choice for high-horsepower, high-torque applications. 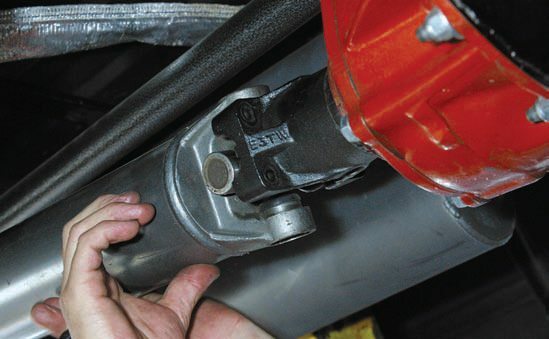 When installing a new or modified driveshaft, harmonics (balance) can be an issue. Always have a driveshaft dynamic balanced. If you have vibration with a new drive-shaft, rotating the shaft 180 degrees may eliminate it. If the vibration still exists, take the vehicle to a driveline specialist who can examine it for vibration issues. AOD conversion kits aren’t always available for all Ford applications. Some AOD swaps involve custom crossmem-ber fabrication. Fabrication shops and hot rod shops are good sources for custom AOD and AODE/4R70W cross-members. If you can provide the dimensions, most shops can fabricate the crossmember you need. 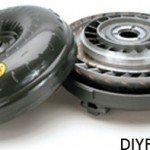 Ford used a torque converter dust cover for a reason: to keep both dust and foreign objects out of the bellhousing. If you don’t have a dust shield, get one. When you add fluid for the first time, bring it up to just below normal range on the dipstick. Remember, as the transmission warms, the fluid expands. If you top off at the “Full” mark cold, you will have fluid all over the garage floor when the sump reaches operating temperature. 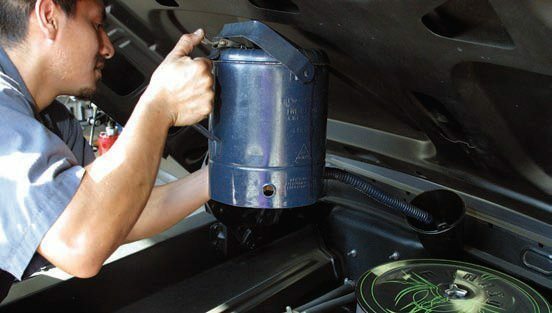 Add fluid in small amounts and allow the transmission to reach operating temperature. Run the selector through all ranges and re-check the fluid level. You want fluid at the 3/4 to “Full” mark hot. Never add fluid above the “Full” mark because it will cause foaming and erratic operation. You can bolt the AOD/AODE/4R70W to Ford’s FE and 385-series big-blocks via conversion kits such as this Bendtsen’s Speed Gems transmission adaptor. Adaptor kits use a crank spacer to move the flex-plate aft into alignment with the bellhousing and torque converter. Adaptor kits are easy to use. It can get tricky at the transmission crossmember and mount, because not all kits have a crossmember. One may have to be fabricated. “Line pressure” is just another way to describe hydraulic pressure. Screw this pressure gauge into the throttle valve pressure port on the passenger side and you get throttle valve pressure. 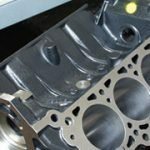 If there is damage and resulting metal particles are present in the fluid, the transmission must be torn down, inspected, and thoroughly cleaned. 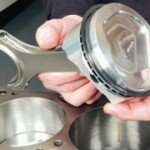 The torque converter must be replaced because it is virtually impossible to flush out contaminants. If start-up is uneventful you are good to continue. With the engine at idle and the vehicle on a level surface, run the selector through all gear ranges and back to park. Make sure the parking brake is set and the selector is in park. Check the fluid again as the sump warms. When the transmission has reached operating temperature check the fluid level, which should be close to the “Full” mark. If it is overfull, you must siphon out excess fluid or face foaming and damage. Examine the dipstick at a hot idle and look for evidence of foaming (air bubbles) and any debris. Once the fluid level is stable and clear, you’re ready for adjustment and a road test. If you’ve installed an AODE or 4R70W it’s a plug-and-play event with a road test and fluid check following start-up. Those first miles with the AODE and 4R70W are mostly a matter of getting to know the process for the PCM; it takes a while to map out a program before everything settles in. Shifts are unpredictable at first but then settle into a predictable routine. Expect to experience some slippage or even a harsh shift or two at first. 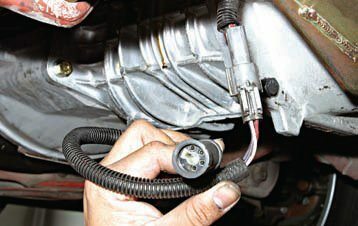 Before you embark upon TV cable adjustment, make sure the throttle cable or linkage is in proper adjustment and the throttle is wide open when the accelerator pedal is on the floor. With the accelerator pedal at rest, the throttle should be at idle stop. An AOD TV cable adjustment is pointless if everything else is out of adjustment. The AOD calls for TV cable adjustment before taking the vehicle for a road test. 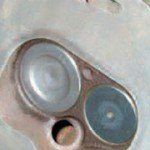 It also calls for a pressure gauge at the throttle valve pressure port on the passenger side of the transmission case. You need a pressure gauge (0 to 100 psi) screwed into the throttle valve pressure port on the passenger side of the transmission case. You also need a 1/8-inch NPT fitting to screw into the throttle valve port along with a minimum of 8 feet of heavy-duty hose that can withstand at least 100 psi so you can read the gauge from the driver’s seat or engine compartment. Make sure the pressure gauge hose is well away from hot exhaust pipes. The throttle valve pressure port gives you throttled line pressure, which corresponds with throttle position. This is the AOD’s stock throttle valve and manual shift linkages. If you have a choice, this is the best setup to use because Ford has done all of the engineering work for you. At idle (throttle closed), you have low line pressure, which is what you want during deceleration and light throttle. With low line pressure, there is no cable tension (throttle closed) and virtually no shift felt (slippage). When the throttle is opened, cable movement and tension increase, modulating line pressure accordingly via the throttle valve, which is what you want when power is applied. The throttle valve does the work of both the vacuum modulator and kickdown on the C4, C6, and FMX. Rather than the intake manifold vacuum affecting line pressure, the throttle valve does it instead. Adjusting the TV cable doesn’t have to be a mystery, because thousands of new Fords rolled off the assembly line without a tedious TV cable adjustment. Assembly workers simply snapped a TV cable block pin into the closed throttle and locked the block and cable. You want a balance between cable tension and no cable tension with the cable slack, yet just short of tension. 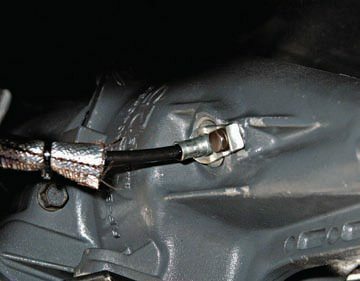 If you have a factory fuel-injected application, install the cable block at the closed throttle and lock the block with everything touching yet without cable tension. You want cable tension just as the throttle is coming off idle. The same can be said for aftermarket cable packages such as Lokar’s. The cable should be slack, with the throttle closed and the accelerator linkage relaxed. The cable must be snug, yet not tight. 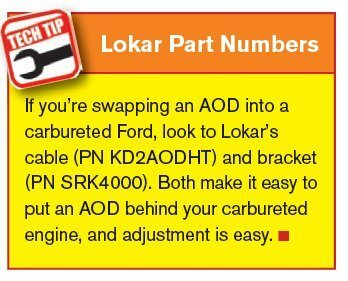 Lokar provides the necessary tools and information to properly adjust the TV cable. 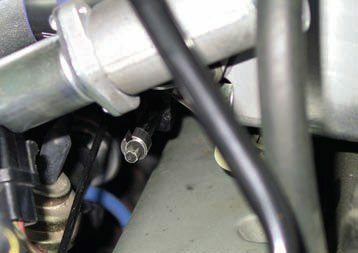 The throttle valve control rod connects the transmission’s throttle valve lever and the carburetor/ throttle body. 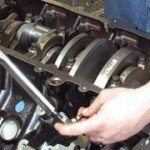 When this throttle rod is properly adjusted, all you have to do is make minor adjustments at the throttle body or carburetor. The sliding trunnion block at the transmission normally doesn’t require adjustment unless it has been apart. 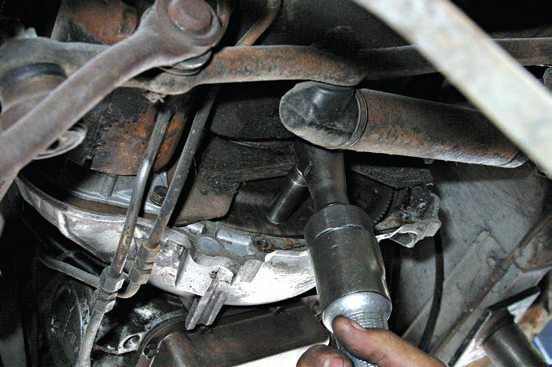 If both adjustments are where they should be, the throttle valve lever just inside the transmission is just touching the throttle valve without any pressure. In other words, the rod is limp with no pressure or tension. Accelerator pedal pressure, no matter how slight, moves the throttle valve. With the engine at idle speed, set the parking brake firmly and place the shifter in neutral. 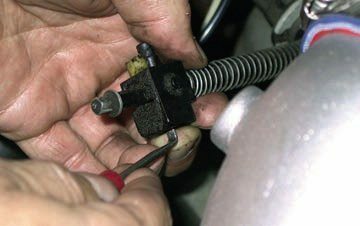 Back the throttle valve rod adjustment (at the carburetor or throttle body) all the way out. Once the screw is flush with the lever’s face, slowly turn it clockwise until the adjusting screw is just .005 inch from the throttle lever. Then turn the adjustment screw three additional turns clockwise. If it is not possible to turn the adjustment screw at least three full turns, the adjustment at the transmission is off and must be adjusted. 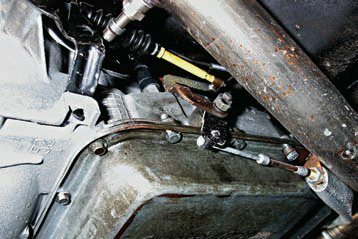 If you have to adjust the rod-style linkage at the transmission, loosen the bolt on the sliding trunnion and make sure the carburetor/throttle body end is firm against the throttle lever. Next, move the throttle valve lever at the transmission against the internal stop inside the transmission (not against the throttle valve) and tighten the trunnion bolt. When you perform throttle valve rod adjustment using a pressure gauge, the engine and transmission should be at operating temperature. With the engine at idle against the throttle stop, insert a thickness gauge or drill bit (.394 inch, 10 mm, or 25/64 inch) between the throttle lever and throttle valve rod adjustment screw. Throttle valve pressure should be 30 to 40 psi. Turn the adjustment screw to achieve the ideal pressure of 33 psi. When the shifter is moved into gear, throttle valve pressure should rise 2 to 35 psi. Never adjust throttle valve pressure with the shifter in gear. Adjustments must be made in neutral. 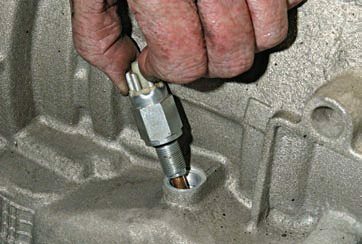 When the gauge/drill bit is removed, the throttle valve pressure should drop to 5 psi. If the pressure is not 5 psi, back out the adjustment screw (counterclockwise) until the pressure drops to 5 psi. Then check the throttle valve pressure again with the thickness gauge or drill bit. It should be above 30 psi. 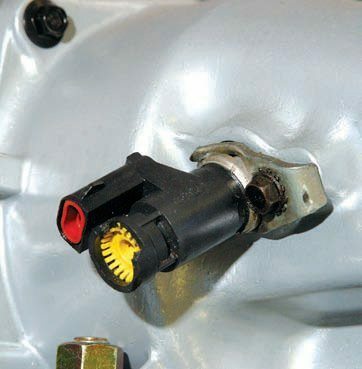 There are two types of TV cable systems used on late-model Fords with port fuel injection. Although the two systems are different in function, they do essentially the same thing. Both pull a cable that operates the throttle valve. It’s how far they pull the throttle cable that affects transmission shift function. With both types, you want the cable slack at idle, yet tension on the cable begins when the throttle comes off idle stop. This is what makes TV cable adjustment simple. You adjust the cable to where it has no tension at idle stop, yet it isn’t slack, either. The only difference between the two cable systems is how they adjust and lock down. It boils down to how far you’re going to pull the cable and move the throttle valve to modulate line pressure. With some earlier AOD applications, you have a toggle-style adjustment at the throttle body. With the engine at idle, the parking brake set, the toggle adjuster unlocked, the transmission selector in neutral, and the T86L-70332-A gauge tool between the crimped slug on the cable end and the plastic fitting, push the cable slider forward slowly until pressure hits 33 psi. 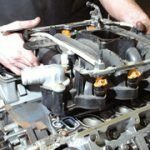 Although Ford recommends using the special T86L-70332-A tool (available from a variety of aftermarket sources) to set the throttle valve pressure, you really don’t need it. With the throttle at idle stop and the throttle valve lever inside the transmission just touching the throttle valve, you should see 5 psi. The T86L-70332-A gauge tool is 10 mm in thickness, which means the cable end and adjuster should be 10 mm (25/64 inch) apart. 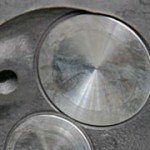 You can make this tool yourself using flat washers stacked to this thickness and achieve the correct spacing, which should yield 33-psi pressure. Then test-drive and pay close attention to shift quality and timing. If you get firm, well-timed upshifts and overdrive/lockup is in by 40 to 45 mph, the adjustment is good. Soft and sloppy early shifts mean poor adjustment. Once you get firm, well-timed upshifts, the goal is to get even better by making finite cable adjustments with more tension. If shifts become hard and delayed you’ve taken adjustment too far. Late-model 5.0L High Output sequential electronic fuel injection Mustangs and the like have a notched self-locking rail adjuster, which is the easiest type of AOD throttle valve adjustment. On the notched rail, you have MIN (minimum), MID (mid-way), and MAX (maximum) cable travel. The key is to adjust enough cable tension into the system so line pressure corresponds with throttle position. This is the AOD’s factory TV cable adjustment with sequential electronic fuel injection (SEFI). It is a notched plastic unit requiring finite tuning one notch at a time that adjusts cable tension. The more tension you have, the later and harder the shift. When you have more cable tension, you get higher line pressure and a delayed upshift. Ideally, you have a nice balance of line pressure and shift timing. The equivalent of the T86L-70332-A TV cable adjustment gauge fits between the cable adjuster and cable end (arrow). With the cable pulled 25/64 inch (10 mm) and locked at this dimension, you should have 33-psi throttle valve pressure at idle in neutral. Set the adjustment, remove the gauge, and you should have 5 psi. You can make this gauge with a stack of washers glued together to a thickness of 25/64 inch (10 mm). To adjust the self-locking rail adjuster, push in on the lock, which releases the notched rail and allows you to move the notched rail back and forth to adjust cable tension. With the cable completely slack, you should have 5-psi throttle valve pressure. Fit the T86L-70332-A gauge or your homemade spacer between the cable end and the adjuster in a snug fit. With the adjuster hooked to the throttle linkage and the engine at idle, you should see 33 psi. These numbers are factory specifications. If you desire an even firmer shift, adjust the cable tighter in one-notch increments. You are safer going tighter than you are looser. Less cable tension and travel means low control pressure, slippage, and failure. 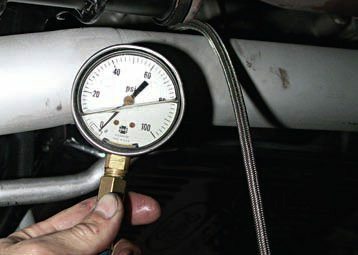 If you don’t have a pressure gauge, you can still adjust AOD throttle valve pressure based on shift timing and firmness, although it is discouraged because everyone has a different perception of shift quality. The TV cable can be adjusted without a pressure gauge by very gently checking shift timing and quality with a road test. Begin TV cable adjustment as already suggested by having the TV cable straight and level yet without tension. Road testing should deliver well-timed shift-points that are firm yet not harsh, yet all of the shifts (including overdrive) are in by 40 mph during light throttle. Soft shifts are a strong indication of slippage, which means you are burning clutches and bands. Remember, you can burn up an AOD in short order with improper TV cable adjustment and a WOT.